Early mortality syndrome - when will we learn? 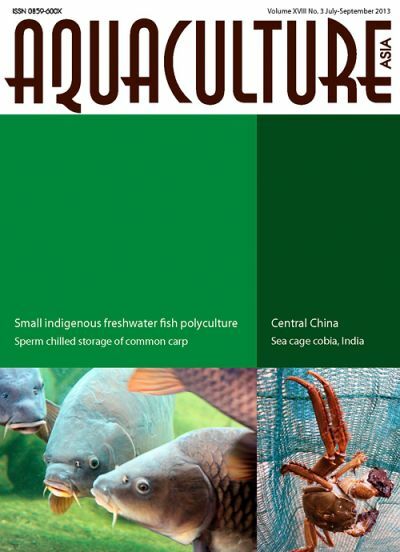 Peter Edwards writes on rural aquaculture: A second trip to Hubei Province, Central China. Sea cage growout culture of cobia Rachycentron canadum in shallow sea of Gulf of Mannar region, Tamil Nadu. 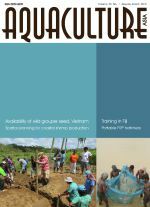 Culture of small indigenous freshwater fish species in polyculture with Indian major carps and high value crops along pond dykes. Mitra, S., Chakrabarti, P.P., Ghosh, A., Jha A.K., Mandal R.N, Mandal and S. C, Jayasankar, P.
Study on sperm chilled storage of common carp Cyprinus carpio in Viet Nam. Culprit behind massive shrimp die-offs in Asia unmasked. Presentations from the final technical consultation on EMS/AHPNS available for download. Aquaculture certification workshop held in Viet Nam. NACA implements World Bank training program on Good Aquaculture Practices. Study tour on aquaculture and wetland management for delegation from Assam, India. Koh Yao Noi Tree Bank and mangrove replanting continues. Consistent fish names key to consumer confidence. Request for contributions: Global Advances in Ecology and Management of Golden Apple Snails (2nd edition).